In April 2013 Oracle fixed CVE-2013-1534 an attack that I’m going to describe here as the guy who originally found it in February 2012 (it was an 0-day for more than a year). For official information please go here Critical Patch Update April 2013. One thing though i do not agree with Oracle that it scored it with score 7.5. This statement goes like this “For Linux, Unix and other platforms, the CVSS Base Score is 7.5, and the impacts for Confidentiality, Integrity and Availability are Partial+.” Basically this is remote attack that gains Oracle Grid Infrastructure owner privileges (basically “oracle”/”dba” in 99% cases) on clustered (RAC) Oracle databases, which gives you access in read/write mode to *all* data. Here I’m following responsible disclosure (vendor notified, fixed, clients alerted) … many, many months later I think all responsible people who care have already patched their Oracle RAC systems… for Patch Set 11.2.0.3.x this means it has been fixed via Grid Infrastructure + DB PSU (PatchSetUpdate) >= 11.2.0.3.6 (current PSU is 11.2.0.3.9; for 11.2.0.3.6 the recommended Oracle Alert docId is 1525152.1: Patch Set Update and Critical Patch Update April 2013 Availability Document). Oracle starting in release of Grid Infrastructure 11gR2 (technically 11.2.0.1) added something like Quality of Service (QoS) for Databases which in practice gives ability for DBAs to better utilize usage of resource between nodes in cluster in compatibility with business requirements. SLA are being managed by the newly introduced QoS functionality by placing workloads on “server pools”. QoS in 11.2.0.1 was not full activated but starting in Grid Infrastructure 11.2.0.2 it is online by default, even without confirmation, etc. It is also being activated by default on any upgrade. The QoS on RAC/Grid Infrastructure is partially being implemented by embedded Oracle Containers for Java (OC4J). qosadmin account (with always default pw of “oracle112″ per Oracle documentation on every install) has always an oc4j-administrators role assigned in /u01/app/11.2.0/grid/oc4j/j2ee/home/OC4J_DBWLM_config ($GRID_HOME/oc4j/j2ee/home/OC4J_DBWLM_config) in file system-jazn-data.xml (JAZN stands for Java AuthoriZatioN). The same security configuration file is also being used as place to control of whether username:password pair is authorized to deploy any J2EE application. This means that OC4J is prone to arbitrary command execution on any Oracle clustered (RAC) database running at least on top of Oracle Clusterware (AKA Grid Infrastructure) >= 11.2.0.2, until CPU (PSU) April 2013 has been applied. This affects both customers using QoS and those not using it. The reason is because OC4J service (serving HTTP interface over port 8888) is always and by definition enabled. The attack would by definition use “qosadmin” account… The QoS for RAC documentation (which nobody does read because it is “new” feature and by definition nobody uses nothing in production like this) states that the password for “qosadmin” should be changed because it may be used for QoS-related functionality. The remaining functionality seems to be not enabled because it was not configured… but there’s more. What’s more interesting is that there is second account named “oc4jadmin” (a typical default OC4J admin), after brute-forcing it also appears to be set to “oracle112″… on every installation out there… and you won’t find a single line in official documentation for RAC that this “backdoor” should be disabled. So in summary every RAC >= 11.2.0.2.0 on this planet has the same passwords set for uploading J2EE applications remotely over RMI (Java thing). The oc4jadmin account is also assigned the oc4j-administrators role. The easiest way to get the admin.jar (however I’ve used the one coming with RAC) is to download it from Oracle OC4J download page as it contains “OC4J Admin Client” (link http://www.oracle.com/technetwork/middleware/ias/downloads/101310-085449.html , 3 disks, total 1.4GB). Probably you need to use admin.jar/admin_client.jar as close to the version of OC4J being attacked (e.g. usage of 9.x.x admin.jar might fail uploading to RAC >= 11.2.0.2 as the OC4J embedded there is at version 10.1.3, etc). I would recommend installing it on RHEL/OL compatible Linux distribution if possible (due to the enterprise nature of Oracle software). The other thing is that you could probably use some ready-to-run RAC VirtualMachine Linux template from Oracle (works for me under XEN). I’ve also tried the metasploit generic RMI uploaders (for JBoss if i remember correctly) but I’ve failed (perhaps it’s possible, but IMHO there are more easy ways). Actually there are only 2 commands and 1 click to exploit this vulnerability. You do not need to write any tools/exploits, just execute several commands to upload cmd.ear onto vulnerable RAC installation due to the default passwords being deployed. [ 2012-06-08 08:14:39.290 EDT ] Application Deployer for cmd STARTS. Basically you can specify qosadmin or oc4jadmin, as I’ve stated earlier it doesn’t matter. Compressed dump - Run dmpfmt with -c flag on dump after uncompressing. As you can see above it attempted any random syscall but on rmsock() – executed by non privileged user – it rebooted system (because of attributes on sys0 device that cause to reboot kernel in case of kernel panic). Typical Denial of Service attack, isn’t it? so as you can see UID of our “ble” system call fuzzing process was 0×64 (or in 100 if you are uncomfortable with hex notations). By changing value at address 0xF1000F0A00000000+0×19000 one could get root shell probably, but researching my way to do that could be very time intensive. echo -e "root's Password: \c"
How does it work? If the above attack is performed, and somebody else logs in using ssh remotely (root or just simple user), then /etc/ssh/sshrc contents are executed (by sshd) with his privilege level. In this case PATH is altered to hijack “su” executions and obtain potentially password. This could be also adapted e.g. to catch “sudo” password too. Potential workaround: drop all SUIDs from all binaries linked to libodm.a (yes i find it kind of hard due to need of dropping even SUID from lsvg, which may break a lot of IBM/3rd software, especially some agents using commands such as lsvg to monitoring stuff. Still IBM AIX doesn’t come with proper hardened protection against /tmp races as mentioned in previous blog entry about CVE-2011-1384. Timeline: almost 180 days to fix for IBM. BTW: This proof of concept could be easily adapted to give instant root (as you can create any file that does not exists), but I’m not going to disclose weaponized versions. It’s been two weeks after publishing official advisory by IBM for this vulnerability in AIX 5.3 (not tested by me) 6.1 (tested by me) and 7.1 (also tested by me) here http://aix.software.ibm.com/aix/efixes/security/invscout_advisory2.asc so i’m going to talk a little bit about technical details. The attack is very trivial and it exists due to the SUID binary invscoutClient_VPD_Survey installed by default in any version of AIX. Fixing is very trivial for this one, just follow the guide by IBM (yup, dropping the SUID does nothing wrong for your system). Next ones to follow… however one thing worries me the most. Whole world knows about such kind class of attacks, but there is not a single major vendor on this planet that would prevent such kind of attacks from happening by hardening the OS kernel. For example GRSecurity and OpenWall projects are completely different, such kind of protection (symlink races, /tmp protection) exists for almost a decade there… but those are kernel patches for Linux, not something I would consider mainstream… unfortunately. GRSecurity is really excellent piece of work, they have implemented a realistic protection against realistic technical real-world flaws. So my question is simple, is any of the major OS vendors is interested in realistic security at all? There is a also a very good discussion about /tmp UNIX/POSIX problems and general poor written code on LWN. Also the list of similar attacks is pretty long (as of writing 264 vulnerabilities). enabled, a sysctl option with name “linking_restrictions” is created. For detailed list of algorithms please consider this link. (much more than DBMS_CRYPTO in 11g, which requires you to buy Enterprise Edition). 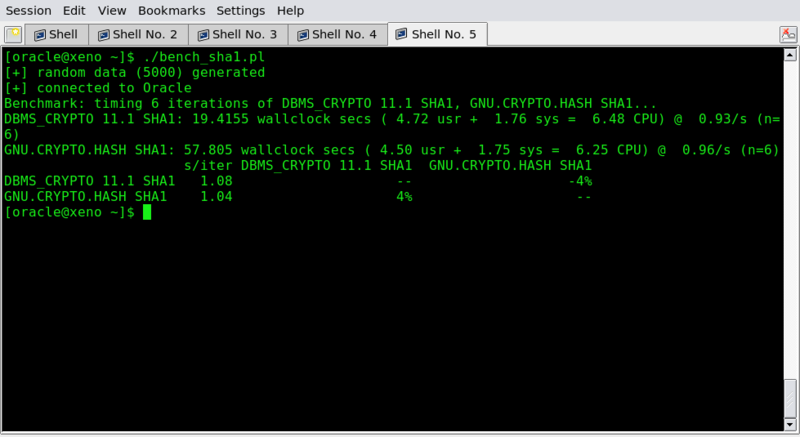 A little bonus, performance verification: DBMS_CRYPTO from 11.1.0.6 versus GNU.CRYPTO.HASH Java library running in JVM in Oracle (oracle_sha1 vs gnuhash_sha1, Oracle does not support SHA-2 standard yet, only SHA1=160 bits). * = UPDATE(12/11/2013): please verify with your Oracle Sales representative. Depending on who you ask and how you ask you may get different answer. DBMS_CRYPTO doesn’t seem to be licensed as ASO anymore, same for SSL encryption for RAC databases even for SE, so in those scenarios if you dont want to have encrypted data on the write you may have less complicated alternatives, YMMV. Of course you could assume (as I did) here that DV protects against SYSDBA role too. That’s why this ora_dv_mem_off.c was spawn. After contacting Oracle secalert (greetz to them for discussions) in Februrary/March this year, it is clear that without in-depth reading of “Appendix C” from official DV documentation you won’t get full picture of the solution. DV was not to designed to protect from OS side – that’s the main technical point here – any database is still open for attack from OS side even with DV. And SYSDBA seems to be disabled from the OS side: that’s correct, you won’t be able to perform “sqlplus / as sysdba” even as Oracle software owner, you can as: “/ as sysoper” at most. In order to perform administrative tasks you require downtime (to relink). So any SYSDBA logged on UNX software owner account could defeat DV (and gain access to sensitive data) but this would be easily spotted. Here’s another solution, disabling DV on runtime. So enjoy, for free this time! And oh, there is theoretical possibility that in future Oracle DV would run under several different OS-user/uids processes, and thus would be able to protect from SYSDBA’s too, but this would need MAJOR rearchitecture. Wyslalem microHOWTO, kody cracka, itd. do Mikrotika, nawet nie dostalem emaila z podziekowaniem. Wyslalem info o technice duplikowania(crackowania) Mikrotikow na tej samej licencji… do wlascicieli Mikrotika. Przyslali mi ze potencjalnie mi podziekuja ( ale z maila nie wynika zeby mi dziekowali?! ), i ze jesli im przekaze wiecej info to mnie nie oskarza w zaden sposob ( taki zrobilem sobie wymog ). Napisali mi ze nie moga mi przyslac nawet swistka papierka mowiacego o mojej dobrej woli i umiejetnosciach… niech bedzie. Hehe z drugiej strony dziwne, ze sie przed tym nie zabezpieczyli – ta metoda dziala od 2004 roku ( oczywiscie w celach edukacyjnych ). + czyli mamy wszelkie zabezpieczenia typu IP source guard / ARPy itd. Entries (RSS) and Comments (RSS). 19 queries. 0.205 seconds.